Is this Phalaris arundinacea picta ? A tussle has been going on in the rose bed at Shenstone between this ornamental grass and White Comfrey ..... the latter is winning but I hope to save the former. Does anyone recognise it please? It certainly looks like Gardener's Gaiters to me! Many thanks ..... I know it is also a rampant grower so I think I will pot it up and sink the pot in the bed. So, do you grow Pampas Grass????? 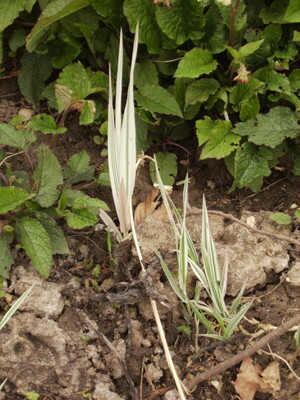 How do I move a pampas grass to a new location? will my papyrus survive outside during the cold months?